Romans and Barbarians. 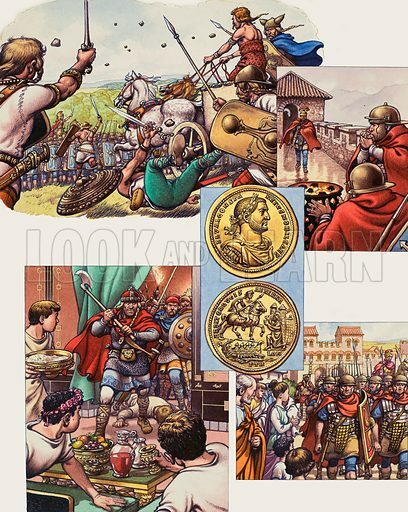 Our picture shows: top left, the Romans invading Britain; top right, Hadrians's Wall; bottom left, barbarians invading a dinner party; bottom right, the Romans leaving Britain; and centre, a medal commemorating relief of London by Flavius Constantius after a revolt lead by a Roman soldier called Allectus in AD 292 (the reverse of the medal shows the earliest depiction of Londinium or London). Original artwork for illustrations on p5 of Look and Learn issue no 476 (27 February 1971). Lent to Look and Learn for scanning by The Gallery of Illustration.